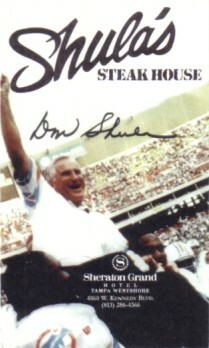 Business card from the late 1990s issued to promote Don Shula's Steak House at the Sheraton Grand Hotel in Tampa featuring a great image of him after setting the NFL's all time career victory record in 1993. MINT. ONLY TWO AVAILABLE FOR SALE.